Sixty percent of new restaurants fail within their first five years. If restaurateurs took this statistic at face value, they might think this is a bad time to launch a new restaurant. However, that simply isn’t the case. 2016 was the first time in history that Americans spent more on prepared food than on groceries. There is no better time to start a restaurant than right now—just not your traditional brick-and-mortar restaurant. The virtual restaurant, which removes the option for patrons to dine in your restaurant, are growing in popularity thanks to the rise of mobile technology and the increased efficiencies of at-home delivery services. In fact, investment bank UBS forecasts food delivery sales to grow annually by almost 20 percent—from $35 billion worldwide to $365 billion by 2030. Virtual restaurants are becoming a staple in most large cities like New York, Chicago, and Los Angeles. Over the next several years, you will see more virtual restaurants throughout the country. Here’s what you need to know if you are thinking about launching a virtual restaurant. Virtual restaurants, also referred to as ghost restaurants, are restaurants that offer a delivery-only dining experience which is facilitated through digital applications and third-party services. These delivery-only restaurants mitigate traditional expenses and overhead while providing customers with a more convenient and faster way to dine. Virtual restaurants are becoming increasingly popular as technological advances continue to improve the online user experience and the efficiencies and lure of delivery services. In fact, many businesses are investing heavily in virtual restaurants and the technology that makes them possible. For instance, GrubHub, one of the leaders in the food-delivery space, recently purchased LevelUp, a business that helps restaurants with digital payments and customer loyalty, for $390 million. How Do Virtual Restaurants Work? Using a web or mobile application, restaurant patrons can view menus, place orders, and pay for their meals online. Once an order is placed, the restaurant is notified and begins preparing the order in their kitchen. After the food is ready, a food-delivery service transports the meal to the patron’s location as specified during the ordering process. Once the transaction is complete, payment is dispersed to all relevant parties. 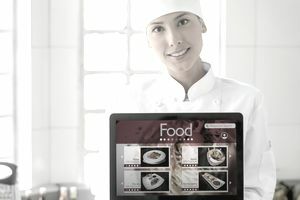 What Are the Benefits of Owning a Virtual Restaurant? Virtual restaurants are growing in popularity—especially in larger cities. One New York-based startup, Green Summit Group, operates nine virtual restaurants inside one kitchen. By avoiding the need to purchase space in a high-foot-traffic area, restaurant owners can use their budget to create a kitchen that emphasizes improved preparation processes and workflow. What Are the Benefits to Using a Virtual Restaurant? U.S. consumers increased their spending on online food delivery by almost 16 percent in the last year. This trend indicates consumers’ desire for home-delivery dining options and the opportunity for virtual restaurants. One of the more interesting benefits of the virtual restaurant for patrons and business owners is how powerful data can be to the dining experience. There’s no denying the impact data has had on other industries. Marketers can deliver strategic ads to users based on their search history, websites they frequent, and other demographic data they make available publicly. Online retailers can use purchasing data to send sales notifications or recommendations to customers. However, traditional restaurants seem to struggle with data collection and management. After all, how can you effectively track a person’s order, their opinion of the meal, and then interpret that in a meaningful way to improve their experience next time? Simply put, you can’t. Virtual restaurants now allow owners to collect and manage data more effectively—which they can use to make better strategic decisions. More interestingly, virtual restaurant partners are also using data to improve the user experience. For instance, UberEATS, a prominent food-delivery service, noticed that users in a Chicago neighborhood were frequently searching “chicken” in their mobile application with few results available. UberEATS contacted a local pizzeria, Si-Pie Pizzeria, to notify the owner of the high demand for chicken in the area. The owner created a virtual restaurant, Si’s Chicken Kitchen, using the same kitchen space as their pizzeria. The virtual restaurant generates about $1,000 a week—delivering more fried chicken than pizza for the owner. If you’re an entrepreneur considering a virtual restaurant business, there are a few things to keep in mind. What Do You Want Out of Your Location? While a virtual restaurant removes the need for dining space, you will still need a location for your kitchen. Rather than targeting an area with a lot of foot traffic, look for space close to consumers’ homes and with room to create an efficient kitchen. What Are Your Delivery Expenses? To operate your virtual restaurant effectively, you need to have a clear understanding of your expenses. Expenses like rent, ingredients, storage, and kitchen staff are variables that all restaurants must consider, but virtual restaurants must also understand the costs of using third-party online ordering and delivery partners. Most of these partners will take a percentage of your sale. For instance, UberEATS takes about 30 percent of the bill, Seamless and GrubHub take between 12-24 percent, and DoorDash, Postmates, and Caviar take 15-23 percent. You must know the delivery expenses before you start a virtual restaurant so that you can price your food according to your profit margin goals. How Can You Increase ROI? Much of the lure of virtual restaurants is the potential for high return-on-investment. Before you start one, be diligent about how you intend to track and measure your return. You can also increase your return by diversifying your menu across different cuisines, operating on days/times you may not traditionally, and listing your business on several online-ordering platforms. How Will You Market Your Virtual Restaurant? With less money going to labor or rent, you will have more resources to put to other areas that can increase business—like marketing. Many of the marketing tactics that work for traditional restaurants will apply to your virtual business, too. For instance, favorable reviews, social media marketing, and PPC are important ways to drive more online orders. Moreover, you will want to optimize your online listings to include images, correct business information, popular keywords, and updated menus. If you’re a restaurateur, there are many reasons to consider joining the virtual revolution. The low barrier to entry reduces financial risks for startups. The decreased overhead and labor expenses allow restaurants to focus their budgets on better quality ingredients, marketing, and improved operational efficiencies. Furthermore, consumer trends indicate that people prefer to eat-in rather than dine-out. Virtual restaurants are more than a fad—it’s a trend that will continue to change the dining experience forever.